Here’s our round-up of the funniest, most thought-provoking and interesting comments you lot made this week. Did you make it in? 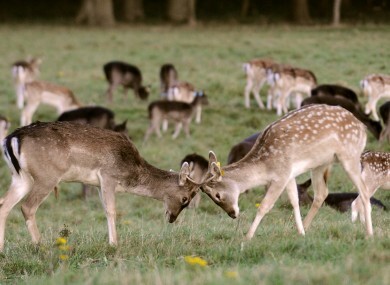 Some deer in the Phoenix Park this week. Definitely not a metaphor for some of the discussions on the site. EVERY SATURDAY MORNING we like to take a look at all the best comments left on the site by you lot over the past week. There was a lot of talk this week about the US election, the new children’s hospital, and the murder of Aoife Phelan. Then there was Gabriel Byrne’s criticisms of The Gathering, the Garda colouring book (really), and whether or not it’s ok to wear socks in bed. It’s been a strange week. So here, in no particular order, are the standout comments from the week that was. This dog will eventually get frustrated with menial tasks, kill his owner, assume his identity and live his life better than the man would have himself. Fact. I sketched around my hand in 1980. Offers above 200k. I an carer for my mother with dementia. Frankly, I think you are all missing the point. Carers suffer isolation which in turn causes stress which causes ill health. Carers would welcome some support from not just the state from society at large. The lack of financial support is only one aspect. If a parent like the gentleman above gives up his employment to take care of his daughter gets very little sleep, no holidays no social outing no amount of govt money will support him. Society needs a change of attitude and change of heart take some responsibility go visit and support him today. Stop expecting politicians to ease the pain go share it. Be a decent neighbour look around open your eyes and heart help. If we could build a battlefield trail, from the GPO through what Taoiseach Enda Kenny called the Laneways of History where the GPO garrison fought in 1916, and build a museum of 1916 in the terrace of houses that they occupied in Moore Street, it would be a fabulous tourist draw. Tourists love narrative, they love story. When I went to Paris, I wanted to stand in the square and walk the roads where the French Revolution took place, and I was fascinated by the stories Parisians told me, and inspired by the preservation of French history. We could do as well in Ireland! When Kilmainham Gaol was a rotting, derelict site, volunteers worked to bring it back and make it a museum – it’s now such a huge draw that last Easter thousands of tourists had to be turned away. I moved to Ireland when I was 18 and have been living here for 10 years. Went to an Irish University, paid my registration fees, paid tax, volunteered, have my home and friends here. Never once have I looked for social welfare and even if I did I wouldn’t be Irish enough to receive it. I also studied Irish politics and keep up with all the relevant issues. So why shouldn’t I get to vote on issues which will affect me as much as an Irish passport holder? On the other hand I get to vote in general and local elections back at home, through online voting. However I choose not to use my vote because I am not familiar with the political parties and current social issues. It’s very hurtful to see all these silly comments above, about immigrants only being on welfare, not contributing anything to the Irish society and so on. I am sure these people would love to hear and see comments like that in Australia, Canada or anywhere else. It’s a bit harsh to say emigrants never contributed to the country. I lived 28 years in Ireland before I left 2 years ago. I made more of a contribution in that time than than many people. No one is suggesting votes for grandchildren of Irish people who never set foot in the country. Or for some who left Ireland in the 1950′s and who has long since taken up citizenship. We are taking about the recent emigrants who grew up here, worked here but no find they have to move away rather than stay on social welfare.Just to illustrate how crazy the system is: Even Irish University students on a Semester abroad are denied the chance to vote. They cannot vote in elections that determine their University fees, grants etc. I must admit I was skeptical. But I was in the states for work back in September and my flight back was loaded up with people coming, a week early, for the Navy V Notre Dame game. I chatted to a few boarding and they were young Irish American students and adults coming for ‘bachelor parties’, on their way to backpacking in Europe, just coming for a holiday and visiting some relatives. This was used as an opening to the gathering, and the US TV networks were bombarded with advertising for the trips.I have cousins in the states and all of them made one or more trips to Ireland, in their 20s, during the 90s. This bread and butter tourism of 1st and 2nd generation Irish-Americans has fallen off, and can be re-ignited by initiatives such as this. What the gathering will hopefully do, is re-ignite that awareness of their roots. Sure, to us, it looks like scamming yanks as we scorn all that the prefabricated side of Ireland has to offer, but have any of you ever met an American who simply identified themselves as American and didn’t care about their roots? Brilliant! Drivers should be forced to display i-plates on their cars for 6 months if they are done for doing something stupid. Gathering 2013 starting early with the return of the Children of Lir. Email “Top readers' comments of the week”. Feedback on “Top readers' comments of the week”.